Desperate to hear bedtime stories, Peter Pan waits outside the nursery window of Wendy, John and Michael Darling. When Peter asks Wendy to fly with him to Neverland, the Darling children are whisked away to a world of adventure – of daring fairies, wondrous mermaids and The Lost Boys. But there is danger in Neverland too: the villainous Captain Hook is out for revenge and will stop at nothing to take it. Like I said, I grew up with this classic, and it was quite fun to read it! I remember when we were younger my brother wasn’t able to say Peter Pan, so whenever he wanted to watch the movie he said Meter Pan, but my parents got the message and put the movie on, at least until we learned how to do it by ourselves! The language in this book is of course very different from what we use today. 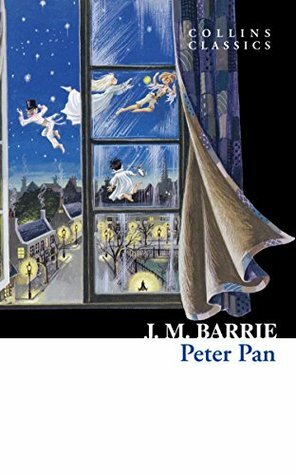 Peter Pan was originally written in 1911 and the setting is London. I encountered a few weird words while reading this book, but all Collins Classics seems to be equipped with a dictionary in the back so I could look up the words I didn’t understand. Considering that Peter Pan is a children’s book I was surprised sometimes by the use of language. An author would never bluntly told how a man was killed in a book for children today, but again I believe it is because the times were different back then and death had a different place in society than it does today. Another thing that amused me was how the story was paused and then it revisited the backgrounds or filled us in in more depth about the character. I found this very odd because the story could have gone on well without this information, but I suppose that was the style back then, and also it satisfied the children. This must be one of the drawbacks with reading a children’s book when you technically are what is considered a grown-up. The description of the characters was also very different from what you see today. Certain aspects I had forgotten, like that Mr. Darling was such a dramatic person, but when I rewatched the movie I remembered haha. While reading I kept imagining the characters made by Disney and it really didn’t fit with how the book characters voiced themselves. I thought they sounded like grown-ups most of the time. When I read the book it also became clear to me why the movie starts with Peter Pan looking for his shadow. It didn’t make sense to me when I was younger, but after reading the book I had a few ‘aha!’ moments about the movie. The book and the Disney movie is quite similar, although there has been made some artistic alterations in the movie, both with the storyline and the characters. What I had completely forgotten about until I rewatched the movie today was that the VHS (yes, I had this movie on VHS! ), copy we had was broken very early in the movie. Something had gone wrong when someone had tried to record something and by accident, it ended up on the Peter Pan VHS. Whenever we were watching the scene where Peter tries to teach Wendy, John, and Michael to fly some sort of program about bugs would come on and we had to rewind the movie forward until we reached the part where the movie was back on. This meant that for SEVERAL years I never knew what was said or what happened during that part of the movie, until today! The VHS was always back to normal by the scene when they start jumping on the beds and singing. I realized today that I didn’t miss out on any action, but a child doesn’t know that. Both my brother and I got used to the bugs and the rewinding pretty quickly though. I would recommend the movie rather than the book for today’s children. The book would be too hard to follow, both storywise and language-wise, but of course, there has been published more modern versions of the old story. The story in itself is amazing and contains all the things a great children’s story should contain. There is action, flying, a magic land, pirates, Indians, mermaids, and a secret hideout. That stuff never goes out of fashion for children! The day it does I’ll feel sorry for the world! I’ve posted the Disney trailer below if you by any chance haven’t seen it.